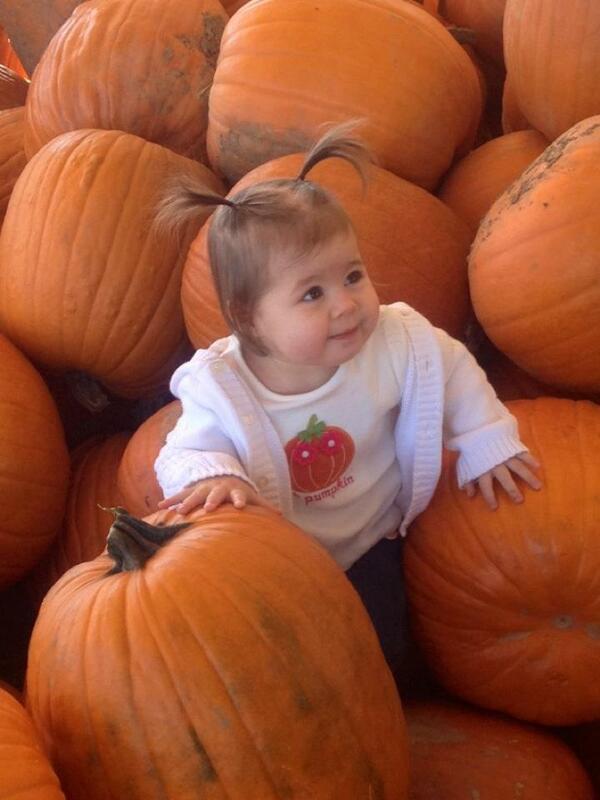 Mia has begun to talk ALOT lately....and one of her favorite words is apple! When Rob picked her up at school the other day she just had to show him all of the apple posters on the walls and say "apple" like a hundred times. It's just ridiculously cute. Mia's favorite word has lead me to blog about one of Rob's absolute favorite desserts EVER. Apple Dumplings! Now let me tell you...no one....NO ONE makes an apple dumpling quite like Rob's Grandma Hogue... or apple pie or applesauce for that matter. She's an apple queen! I've made my share of pies and pie crusts and I must say that they're one of my least favorite things to bake. I get so nervous rolling it out because you're not supposed to touch it a lot or it totally loses it's flakiness when it bakes. I can never get the shape of my pie to hold form so it has big dips and mounds on the top. 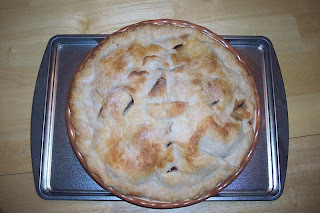 I've come to realize that pies are not the thing to bake of you're aiming for perfection in how it LOOKS. 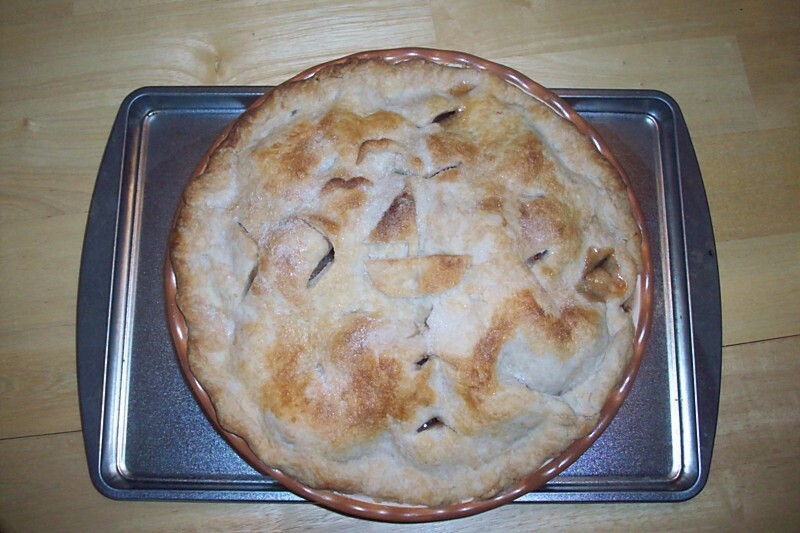 Here's a picture of an apple pie that I made in 2009 at Lake Chautaqua. We had an apple tree in the backyard and it yielded really nice apples that year! Notice how I had to cut out shapes to decorate the top of the pie (it's a sailboat and birds lol)...it was a sign of my future!!! I'll just stick to cookies and leave the pies and dumplings to Grandma Hogue and Trax Farm! We went to Trax Farm on Monday morning so that Mia could climb on the pumpkins and try some apple cider and just experience the very best parts of the Autumn season. Our shopping cart quickly filled up with all things apple! We shared an apple turnover doughnut, bought apple wine, apple cider, and Rob couldn't pass up a 2-pack of apple dunplings for $2.99. I don't think he's ever eaten a dumpling that wasn't made by his Grandma...so I knew what the end result would be....but we bought them anyway. I was really looking forward to enjoying dessert later that evening. It's very rare for me to have a dessert at my house that I didn't make....and usually when I eat my own cookies, cakes, etc. I'm so super-critical that it's hard to enjoy them. Mmmmm....we had this ice cream in our freezer and it is the PERFECT pairing for any type of apple dessert. I seriously LOVE this ice cream and that's weird because I usually only like chocolate frozen desserts. GO BUY THIS ICE CREAM. For real. You won't be dissapointed. Anyway, we baked the dumplings for 25 minutes at 375 degrees and the house smelled divine :) Add a scoop of ice cream, sprinkle some cinnamon on top and voila! A perfect autumn dessert. Isn't this the cutest little white baking dish? $1.99 at IKEA...I just HAD to have it and I never knew why. NOW I KNOW! I's a "dumpling for 2 baking dish!" Rob had a glass of milk with his (yuck) but I drank some apple cider! Come to think of it....hot tea would have been a good choice. Maybe next time. My review? Trax Farm made a pretty good dumpling! The crust was flaky and not too doughy on the bottom. The apple was perfect...not mushy at all and still very flavorful. It was lacking some sweetness which I think I'm used to from Grandma Hogue's secret cinnamon drizzle...but the ice cream made up for that! Overall I'd give it a B+. Rob's review: "It's not my Grandma's." Well....duh.....I knew that was coming. And YES...I'm still baking sugar cookies these days...I promise that the next blog will be back on track! I just get so side-tracked!